I made a tour two weeks ago and I really enjoyed it. You showed me great places and made me a great holiday in Fiji. The people are all very friendly and I really liked the tour guide Mike and the driver Sharlendra on my last day to the airport. 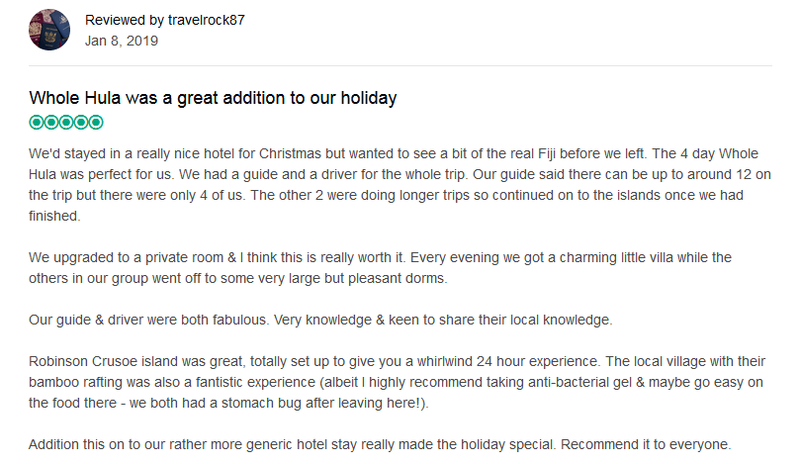 Very helpful, friendly, relaxed and gave me good tipps for next time. I will definitely come back to Fiji and recommend ttf and Feejee Experience. Thank you for a great time in Fiji. It was amazing! I am writing to give feedback on my recent Lei Low tour from the 21st - 26th July. I stayed in Fiji for a total of 5 weeks and this tour was by far one of my favourite experiences throughout my whole stay. I found the 4 days touring around the main island a lot of fun, and also very educational. I was able to learn so much about Fiji's culture and history; and found it really interesting learning abut Fiji's cannibalism days! The itinerary for the main island is excellent, with great accommodation, fun activities and cool stopovers; such as passing by the Fiji Water factory and Maui Bay . My favourite parts of this tour was visiting the beautiful waterfall, and the museum in Suva. The only way I think this itinerary could be improved would be if it could be extended. Four days feels like too short of a time, especially as you really end up bonding with your 'travel family'! Maybe if an extra night could be added exploring the nightlife in Suva, as I hear it is quite the party scene. I must say our guide Jo, and driver Komai helped contribute to it being such a great tour. I really can not fault them. From the very beginning Jo brought the whole group together, turning us into a very close knit travel family. Both guide and driver displayed high levels of professionalism and made sure that everyone was happy at all times. Jo is such a lovely person! He was great fun to be around and was extremely knowledgeable- I was able to learn a lot from him. Please pass on my thanks and appreciation to him! I would highly recommend Feejee Experience as a fun way of seeing the country and learning all about the culture and traditions of Fiji. I have already recommended it to many of my traveller friends visiting Fiji :) Keep up the good work! I’m emailing you to let you know how much I enjoyed my Fiji experience. I had josaia as my guid and Iliesa as the driver and they were both fabulous. Both jo and Iliesa shared so much knowledge of Fiji and made it a very cultural experience. They are the most lovely and friendly people I could have ever asked for to share the experience with. I’m sure anyone else who has them taking their Fiji experience trip will feel the same. I’ve had a wonderful time in Fiji and it’s thanks to them. They are both a great asset to the team. Hi having just finished the tour, I would like to make a special mention of Sam, the driver and Mike. What a team. They really made the tour so fun for us. A great combination of personalities. I just wanted to send you all an email with regards to my recent tour with Feejee Experience (6Jan - 16Jan) and to pass on a MASSIVE thank you!! To the team that assisted with my booking from the start via email and answered my questions, thank you - because of your assistance I went ahead with booking the tour! However, the biggest thank you has to go to my tour guide Suka! What a legend! I was a bit nervous at first when I found out that it was only myself on the tour and that for the 4day mainland tour it would just be Suka, a driver and myself...but WOW...what an experience! I had so much fun touring around with both Suka and Soko (driver), they were so helpful, super informative and made the trip the best! They made sure I was ok all the time, shared their stories with me about Fiji and pointed out really interesting things along the way. I had my own personal tour and it was amazing! You should be very proud of Suka, his attitude towards and passion for Fiji shone through in all that he did! This was my first trip to Fiji and will definitely not be my last! I hope that you will pass on my appreciation to both Suka and Soko (thanks guys!). Bula! It's been 2 weeks since I came back from Fiji, everything started to get in order. We have been sharing photos among members of our traveling group. 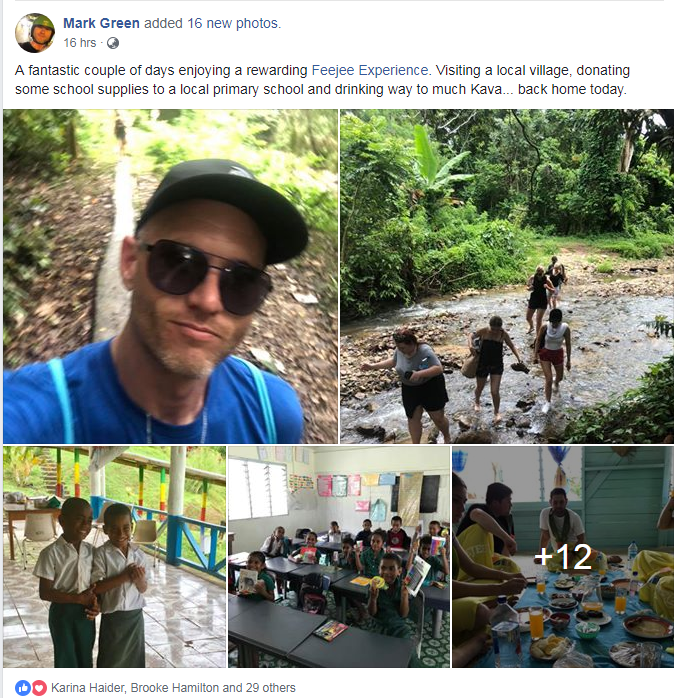 These pictures really bring back the fond memory of the trip of New Zealand, Australia, and Fiji, especially FIji, because of you, our tour guide. Your were very friendly and treated us more like friends than your customers, very personal and warm.We all liked you very much. Your Bula greeting, smile, and good introduction of Fiji made our time in Fiji very enjoyable. We also really appreciated your quick decision to go back to the village to find the Ada's lost passport. The trip concluded with a happy ending. It is coming to the end of my time in Fiji and I just wanted to leave some feedback on the feejee experience tour we had. We were recommended feejee experience by two friends who had done it earlier in the year with a guide called Suka and had loved it. When I booked it with my two siblings I had high expectations and let me tell you that it met every one. We were lucky enough to also have Suka as a guide and he is honestly the best guide I could have asked for. Not only was he fun, friendly and enthusiastic but he also ensured that we were all included and comfortable. He also notably went out of his way to find vegetarian places for my sister to eat at when everyone else wanted McDonalds. I would appreciate you passing on my thanks to him for such an enjoyable experience in which I had great fun and learnt lots about the Fijian culture. I wish him all the best and have already recommended feejee experience and Suka to several friends planning to visit feejee in the future! the places that we visited were amazing, good range of activities. Maryann was beyond amazing!. She made the trip. Because of her i will tell everyone about Feejee Experience. Maryann was the best guide ever. Getting to know the group and the amazing tour guide and driver was the highlight of Feejee Experience. The whole 4days was an amazing experience. Maryann is amazing. Thank you so much for every experience you made our trip extra special. Best way to experience the real fiji. The village and the constant laughs throughout made the highlight of my trip. I just wanted to send you an email to say a HUGE thank you for my trip on the Feejee Experience. It was the most amazing trip and I loved Fiji and the trip I think made it even more amazing for me. From the moment I arrived and until I left your whole team were so helpful and welcoming. All the accommodation was just amazing and could not believe the value for money, they were perfect! The tour covered everything and more beyond my expectations, truly was just out of this world I loved every part of it. I would like to also mention that my guide Kay was just the most informative and nicest guy, he really treated us like his friends and not just a tour group. So so helpful and ever so interesting not just with information about the country and locals but his own experiences which was nice rather than just someone reading from a guide book! The only thing I have to say that I wanted is more time there!! I will definitely be returning and you can count on me to be recommending FeeJee Experience to all that come into OzIntro and anyone I speak to!! I recently did the Mangos and Mantarays feejee experience. I forgot to hand up my feedback form. I had a great time, trip was really good, my guide Kay and driver Elija were brilliant guys to experience Fiji with. I will recommend Feejee Experience to everyone I meet!!! I just wanted to provide Feejee Experience and especially you, Emi and Eliza, with a big thank you for such a great time in Fiji. The effort everyone made to make sure that we made it out to Mango Bay even with the last minute booking was exceptional. Emi and Eliza were fantastic tour guides and we had such a great time with them and the rest of our group. The private rooms of the hostels included in the Feejee Experience were some of the nicest we have stayed at anywhere and all of them exceeded our expectations. So again, thank you so much for the fabulous time in Fiji! I just wanted to email to say what a FANTASTIC time I had on the Whole Hula, Feejee Experience tour last week. Our guide 'K' and driver 'Mr A' were both really fun, friendly and informative and made sure we had a great time, giving us what felt like a private tour, as there were only 2 of us on the tour. The tour was so varied with activities such as jungle trekking and snorkelling being matched by cultural activities such as the village visit. There was also time to relax on the beach and in the mud pools and hotsprings. The resorts we stayed at were awesome and the staff were all so accomodating and friendly! I had so much fun, tried new things and learnt loads. Thank you so much K, Mr A and FeeJee Experience! Ill definietly be recommending the tour to my friends.